Thin, Thick Or Troublesome: Your ONLY Guide For Fab Eyebrows! Eyebrows can be a girl's best friend or worst enemy depending on their current situation! They help frame our face, make us look younger and even achieve the most dramatic of make up looks. But what do you do if your eyebrows are driving you nuts and no amount of threading or waxing can get them to be just right?! Here are three tips to end the most common brow woes! Image: Deepika Padukone On Instagram While we are seeing a lot more of thicker, more natural brows in today's fashion magazines - thank you Cara Delevingne - when brows are overly bushy they can be slightly overwhelming. The best way to go about these bushy brows is to stand yourself in front of a mirror and figure out what shape would best suit you. Beauticians are likely to avoid plucking because they are afraid you will complain. If you have a square face be sure to keep your shape and just smoothen out the rough edges. A high arch will suit this face shape. If you have a round face a high arch will suit you and angled eyebrows that are elongated towards the end will help lessen the 'roundness'. If you have an oval face then flat eyebrows with a low angled arch would suit you best. They help even out your face rather than draw emphasis towards it in a vertical way. If you have a heart shaped face go for round eye brows that are shapely but not overly angled. Ask for a rounded arch. Since you likely don't have to worry about filling in your eyebrows, we suggest getting hold of an eyebrow highlighter such as this one from Benefit cosmetics. This will help accentuate and give a very polished effect while make you glow. 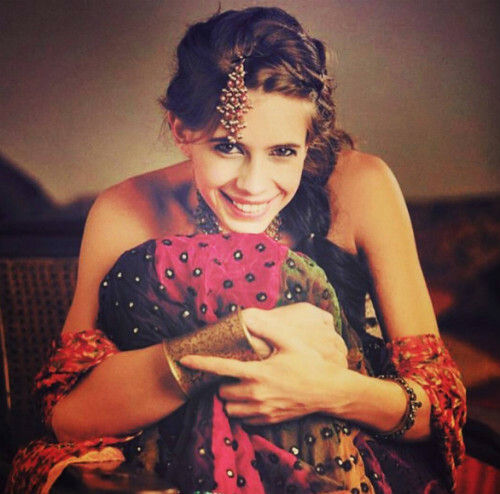 Image: Kalki Koechlin On Instagram A lot of people are born with naturally sparse eyebrows, others have attacked their brows with a pair of tweezers one too many times! Whatever the case, you need not worry as there are plenty of make up solutions for this issue! BTW: You can also apply castor oil to your eyebrows if you have over plucked them - many swear by this to help your brows grow thick! Pick a soft eyebrow pencil that is one shade lighter than your natural colour and pick a setting powder that matches the colour of your brows. Using a spooley brush, brush your eyebrows so that they look as neat as possible. Then, using the pencil - begin to fill in your eyebrows where they look sparse. Finish using the brow powder and then you can even use some hairspray so that they stay in place! We recommend this fabulous product by Maybelline! Why not check out this video tutorial to help turn you into a pro?! Image: Malaika Arora Khan On Instagram Everyone thinks their brows are troublesome, but if yours are really quite unruly and just never seem to come out right or consistent no matter which salon you go to - then we have the ultimate at-home solution! You can get yourself some brow shapers. They work as templates and come in a variety of shapes and sizes, so you can find one that suits you. Why not take them along to the salon with you next time and ask the lady to use them to guide her as she shapes your brows? These will help maintain consistency! Another trick you can try for getting unruly brows to behave is applying some clear mascara on them to ensure they stay in place. It hardly takes a few seconds too. HAVE A STORY IDEA FOR POPxo? If you want to hear about it, we can write about it! Just tell us your idea here! MUST-READ: The ONLY Tricks You Need For Beautiful, Well-Shaped Eyebrows!! MUST-READ: Beauty 101: Cheat Your Way To Perfect Eyebrows – At Home!